← Odd modelling ideas #666 – A challenging prototype? One of my continuing issues with N gauge is the poor appearance of the trackwork. This, together with the heavy looking wheels – OK on diesels, but obvious on steam locos, has often temped me over to the 2mm dark side. However, even with the wonderful conversion kits available from the 2mm Scale Association, I am not sure I have the skill, and more likely the time, to build in 2mm. Finetrax has gone a long way to improve track standards, with Code 40 rail and cast frogs, giving very easily built and good looking track. It’s very similar to the 2mm Scale Association Easitrack in concept and design. I believe the designers talk to each other – a radical concept for our hobby? Yet to my far too fussy eye, the frog still looks a bit heavy. Ok I’m sure some of you have seen my build over on RMWeb but others may not have so felt I should post here too. Firstly what is N2? It nothing new really but using 2mm association components to build better track that will accept standard N wheel standards. 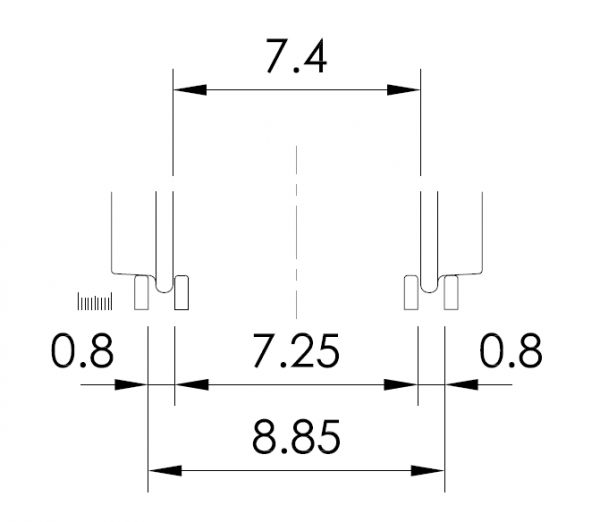 What defines it as N2 though is that it doesn’t just use code 40 rail set to the wide standards used by Peco etc but requires the narrowing of gauge through pointwork to allow 0.8mm flangeways without having to reset back to backs. Having experimented with many combinations of standard I devised my N2 based on the diagram below. The end result looks good to me. Interestingly, the concrete track on the main line is 9.42mm gauge Easitrack – N gauge stock runs fine on it, but obviously won’t go though the points. This looks a good option if you only have stock built in the last 10 years or so, without steam-roller or pizza-cutter wheels. It bears thinking about for future layouts. I have soldered up track in the past, and even managed to do the frog point and blades – the tricky bits here. And of course one advantage is that you can have whatever geometry you like for the track. 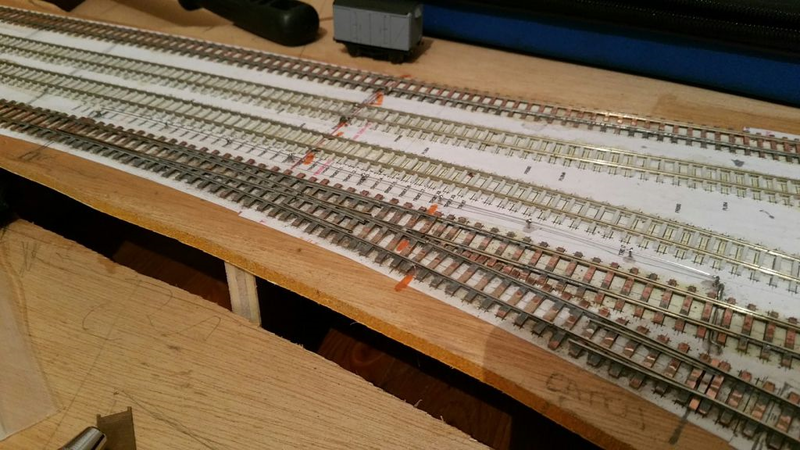 It could be a reasonable compromise between 2mm and N.
This entry was posted in Hints and tips, Inspiration, Jon's layout ramblings, Layout design and tagged 2mm Association, Hints and tips, inspiration, Layout design. Bookmark the permalink. Interesting subject. Thank you for sharing this update. I thought of a layout featured in the RMWeb forum titled Waton. Built in N, I believe it used track that was both traditional through the turnouts and then using 2FS track for the plain track. It looked superb and seems to work quite well despite the variation in standards respectively. Thanks for the link. I haven’t seen that yet but will look for it. I got into handbuilding N gauge track to try and simply remove some of the visual weight of it. Part of that problem was the old code 80 rail that I’d always used. The other parts were the components of the turnouts which I felt just looked bigger than they needed to be. All of that within the NMRA spec for N.
I’m certainly interested in the subject of further refining the track standard for N. Thanks for bringing out this discussion.